As a service to our friend in the motorcycle community, we’ve put together a list of some of the most popular motorcycle bars and biker-friendly bars in the Visalia area. We’ve been to tons of biker bars over the years, but we can’t see ’em all . . . so if you know of a great motorcycle-friendly bar in Visalia that should be included in our list, give us a call or send us an email. We’re always on the lookout for another, biker-friendly watering hole! Have fun, but as motorcycle accident lawyers you know we’re going to say this: be sure to drink responsibly and never drink and ride! If you’d like to read our rants on all sorts of motorcycle topics, check out our motorcycle blog. Great home-made pizza and full bar. 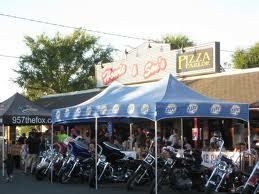 They sponsor “2 wheel Tuesdays” – a terrific motorcycle gathering every Tuesday night in the summertime. If you like pizza, beer and motorcycles, this place is for you.